• PLOT SUMMARY: San Diego Comic Con Exclusive Cover. UTOPIA TIE-IN! - Who are the Dark X-Men and how did they come to be? FIND OUT HERE! Each issue has 3 11-page stories, each dedicated to one of the Dark X-Men and how they came to be part of the team. This first two issues focus on Emma Frost, Mimic, Cloak & Dagger, Daken, Weapon X and Dark Beast! 40 pages, full color. Written by PAUL CORNELL, JAMES ASMUS & SHANE McCARTHY. Art by LEONARD KIRK, JESSE DELPERDANG, IBRAIM ROBERSON, JAY LEISTEN & ANDY LANNING. 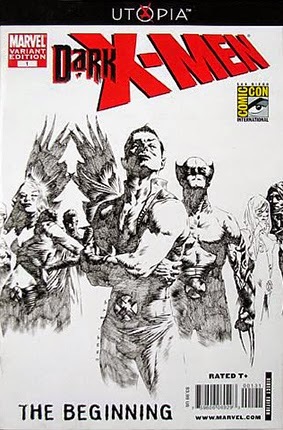 #1A Cover by JAE LEE.